‘Have you got a red hat?’ friend An asked me. Recently she became Princess Pollyanna, an esteemed member of Hobart’s Scarlatt O’Hatters (http://www.hobartredhats.com/), and urged me to join particular excursions that have a connection with my walking project. 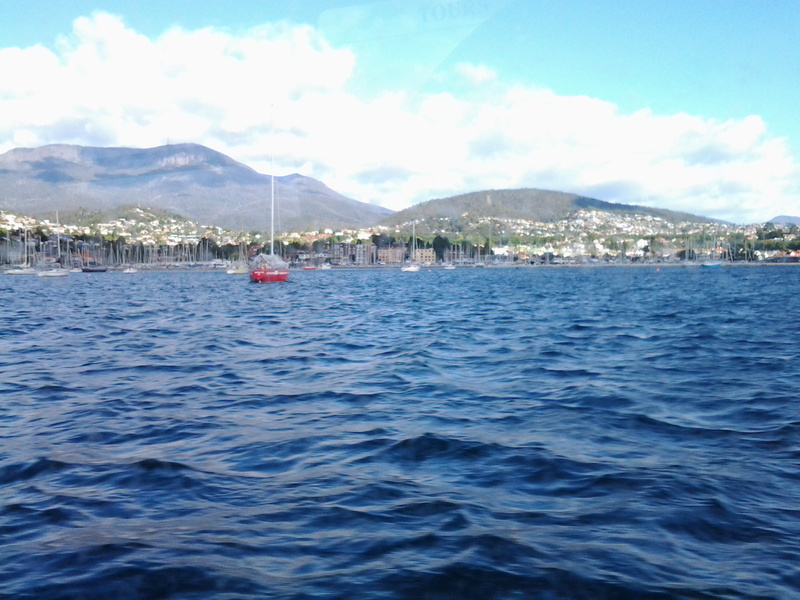 The delicious carrot being wriggled before my eyes was a ferry trip from Hobart to New Norfolk on the Derwent River. I paid my membership fee to Queen Poppi and then found a common red beach hat (although others were wearing all manner of superb creations on their heads – are these the modern day ‘mad hatters’, I wondered). I donned a range of purple clothes and, as the newly appointed Lady Walkabout, jumped on the tiny water taxi ferry with 20 colourful new friends to be. The wind was strong and some swell across the River kept us bobbing. However, the ride was comfortable and no one needed to bark at the fish over the side. Sprays of salt water marked the windows and there were few opportunities to move outside into the clear moist air. But the day was beautiful, the wind chopped waves dramatic and the panoramic scenery majestic. What a thrill the journey was. 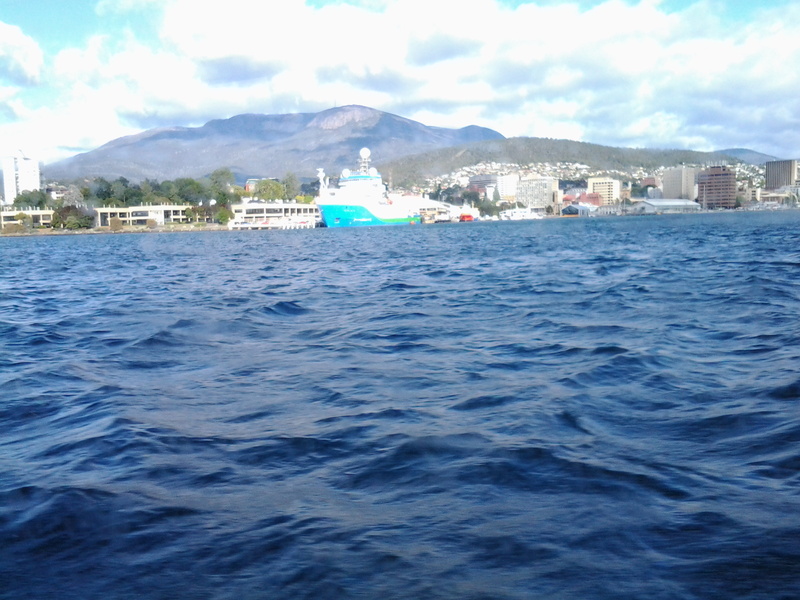 After we left the jetty at Wrest Point Casino in Sandy Bay, a southern suburb of Hobart, we motored with commentary from our driver. He pointed out environmental and historical features. This was a wonderful reminder of research and findings I made while walking the edges of the Derwent between the mouth of the River and Bridgewater Bridge, and I learned a few new details. 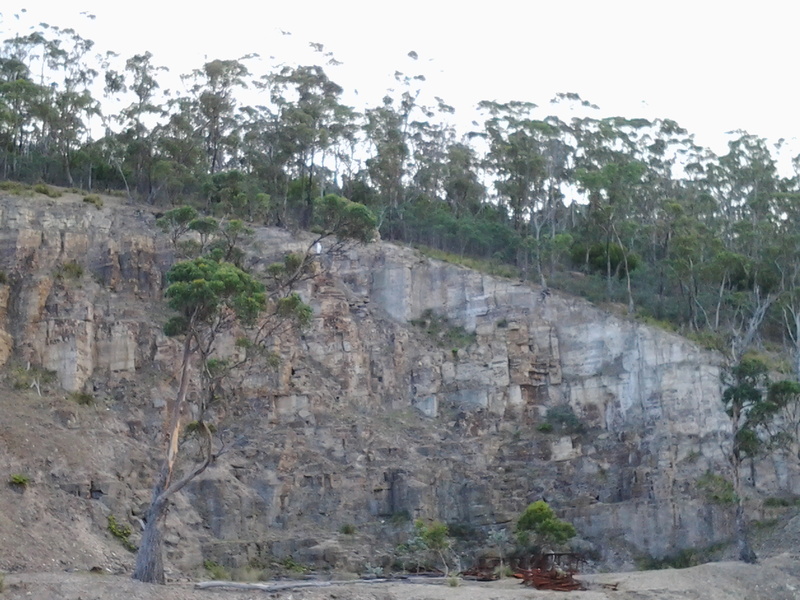 The surprise sighting of a white sea eagle perched in a high tree against the cliffs in Shag Bay (an inlet between the Bedlam Walls – refer to my Stage 6 report) inspired the driver to stop and allow us outside to get a privileged view of this large bird. One of the great treats of the day was motoring underneath the very low Bridgewater Bridge (reminded me of travelling on some flat top boats in Paris where you feel sure the boat will become wedged against the bridge metal) and passing through without a bump or grind. During our trip, at one stage hundreds of coots flew up from the water, we were accompanied for part of the journey by a small flock of sleek long necked swans, and in a small inlet a large family of pelicans were flying around. Our eyes focused on all these birds. As we continued on the Derwent River against landscape which I am yet to see on foot, it was clear my earlier belief that marshlands will prevent me from walking directly next to the River for most of the way from the Bridgewater Bridge to New Norfolk, is correct. Occasionally it will be possible to walk on paths and grass, but mostly I will be tramping the hard road verges. I was not aware the remains of a historic Lime Kiln sits beside the water, and it was good to see that I should be able to walk pass this on my way northwards. As a result of this one-day excursion and from many car trips up and back to New Norfolk, I have a good understanding of the route. However, I realise that at foot level the world looks completely different and I look forward to finding out more in the near future. understanding of the route. However, I realise that at foot level the world looks completely different and I look forward to finding out more in the near future. 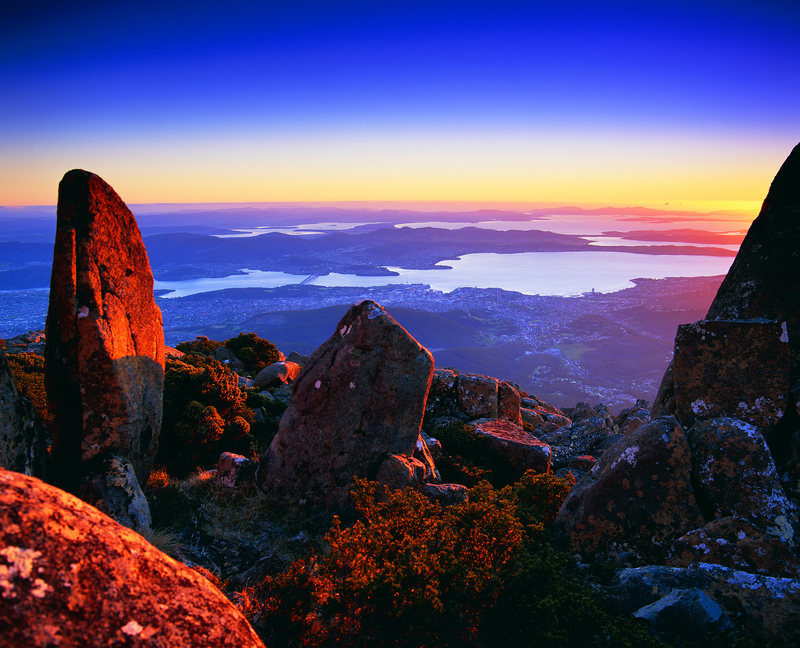 This entry was posted in Derwent River, Hobart, Tasmania, Walking and tagged Austins Ferry, Bedlam Walls, Bridgewater, Coot, Hobart, Lady Walkabout, Lime Kiln, mad hatters, New Norfolk, Paris, Pelican, Princess Pollyanna, purple, Queen Poppi, Red hat, Sandy Bay Road, Scarlatt O'Hatters, sea eagle, Shag Bay, Stage 6, Swan, water taxi, Wrest Point Casino on March 11, 2015 by Tasmanian traveller.